Iowa Senator Chuck Grassley says it’s a “foregone conclusion” that if Roy Moore is elected to the U.S. Senate today, the Alabama Republican would face an investigation by the Senate Ethics Committee. Grassley, a Republican, says the Senate would be forced to act after such a probe that would “dig in and find out the truth” about sexual misconduct allegations against Moore. Several women accuse the 70-year-old Moore of a range of misbehaviors — from making unwanted advances to sexual assault. Some of the women were teenagers when Moore was in his 30s. Grassley is withholding judgment on Moore, since he may soon be called upon to cast a vote on Moore’s future in the Senate. “You know how a juror is,” Grassley says. “If you’ve expressed how somebody’s innocent or somebody’s guilty, the lawyers for the two sides aren’t going to let you be on the jury. 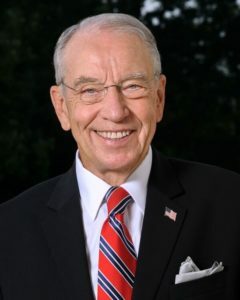 Senators are in the same place.” In a conference call with Iowa reporters, Grassley was asked if he could comfortably work along side Moore starting next month, should he win. “Now you’re asking me if I can work with somebody. I can work with a lot of people,” Grassley says, “but I don’t know Moore, other than having a 15-minute conversation with him in my office.” Moore faces Democrat Doug Jones in today’s election, in a case that’s drawn national attention for months and tens of millions of dollars in advertising.